Mrs. Alyson Garner is a graduate of Hermann High School and an alumnus of St. George School. 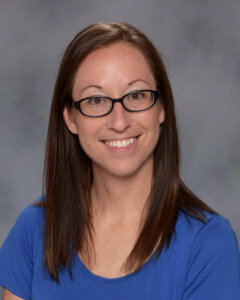 Mrs. Garner graduated from Western Governors University with a Bachelor of Arts degree in Interdisciplinary Studies for K-8 and received her Master of Arts degree in Psychology from Northcentral University. Mrs. Garner teaches 4th Grade Religion, Math, and Language Arts as well as 5th Grade Language Arts. She has been employed by St. George School since 2013. Mrs. Garner believes that parents and teachers are integral figures in a child’s education and that every child has the capability to succeed and become lifelong learners.